High-speed printers for bankcard, POS, fast food, restaurant and convenience store use. Designed for such applications as receipts, journals, kitchen, ticket, and credit/debit card transactions, the iDP-3550 series has a cash drawer kick out feature that can control two drawers. 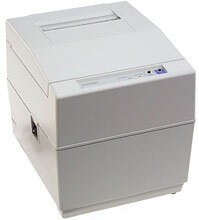 The iDP-3550 series also features a 6k-byte memory buffer, two color printing, and semi-automatic paper loading. It weighs six pounds and prints up to 3.6 lines per second. The Citizen 3550P-40PF120V is also known as Citizen America	CIT-3550P-40PF120V	or 3550P40PF120V	.